The Managing Directors – Karl and Anton Maurer – embody this vision. Extensive experience, superior know-how and the courage to attempt something new have characterised the company since it was established by Toni Maurer. Together with extremely solid commercial management, these attributes constitute key factors that ensure the company’s success. As a company, Toni Maurer has grown from being a workshop for agricultural machinery to being a company with global operations, ranking among one of the largest and most respected companies in Europe in the areas of special vehicle manufacturing, special purpose HGV construction and HGV modifications. You will find further information on our products in the section titled Vehicle Construction. The fact that Toni Maurer GmbH & Co. KG (LP) has become a market leader in the special vehicle construction segment is to be attributed, above all, to extensive know-how and high quality. In order to continue to guarantee this quality, the company as a whole is DIN EN ISO 9001 certified and is also certified as a qualified re-construction partner in accordance with MAN quality guidelines. The company has also been verified as being a quality-focused vehicle manufacturer in accordance with the new EC Directive 2007/46/EC. Similarly, we have our well trained employees to thank for being able to offer such high quality. For this reason, we regularly carry out further training for our employees so as to remain au courant with state-of-the-art technology. Drawing upon Kaizen, we guarantee CIP by virtue of a high level of engagement on the part of our responsible employees, as well as their ideas and suggestions for improvement. For the third time, Toni Maurer GmbH & Co KG was present at the IAA – highlighting the special vehicles branch. After showing special 2m wide crane-truck for highway work in 2014, short heavy transportation 4-axle solutions, agricultural cab on MAN TGS chassis and the famous Janus tunnel fire-fighting vehicle in 2016, 2018 was even more interesting. Five steered axles – four driven axles – own chassis – central 300kN outrigger (one on front, one on rear). 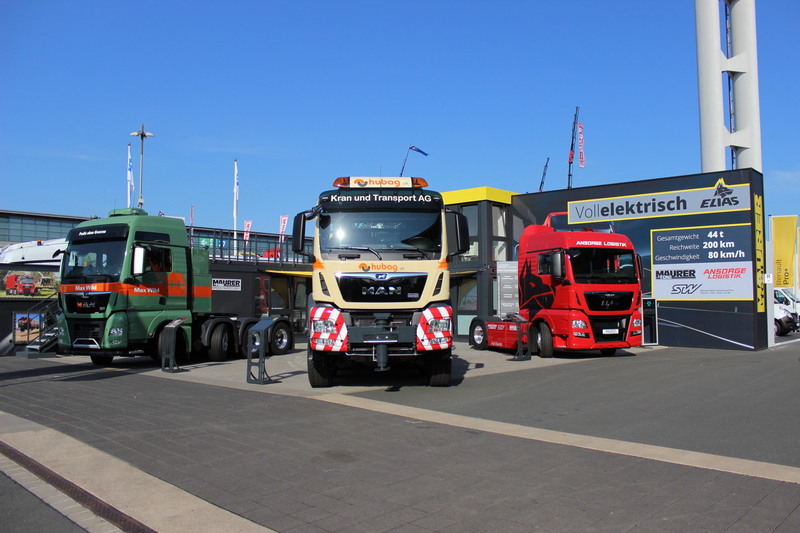 In addition, our full-electric truck tractor “ELIAS”, a common research project of local companies STW and Ansorge Logistik based on a MAN TGX, had its first public appearence. While the ELIAS truck tractor continued after the exhibition to first test drives, the five-axle crane vehicle directly went to the customer, carrying out most difficult cranework in most narrow environment in the Swiss alps. 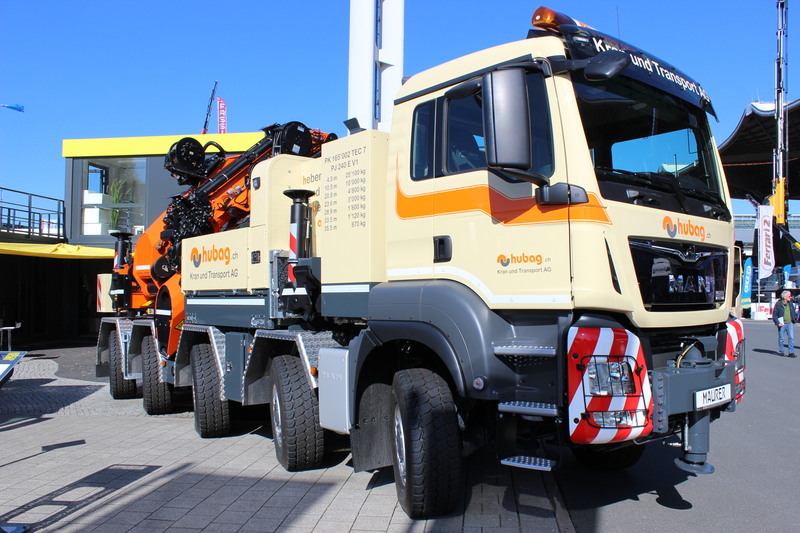 For the first time, a Palfinger PK165000 was mounted on a chassis with four driven axles, therefore the crane base was fully integrated into the vehicle frame to be inside the 4 Meter Height envelope. Thanks to the massive outriggers on the front and the rear of the vehicle, the crane can operate it’s full capabilities in 360°.